You know those chocolate advent calendars you buy at the store for your kids? The ones with the little windows that your kids open each day in December to count down to Christmas and get a little chocolate. Those are great for kids and the excitement leading up to Christmas. But wouldn’t an advent calendar geared towards an adult be fun? Now you can countdown to the holidays in skin-loving style with The Body Shop’s 24 Happy Days beauty advent calendar! This indulgent treat features a beauty surprise behind every door, from bestselling bath and body care to sparking fragrance, plus their latest additions. Purchase from The Body Shop for $99! 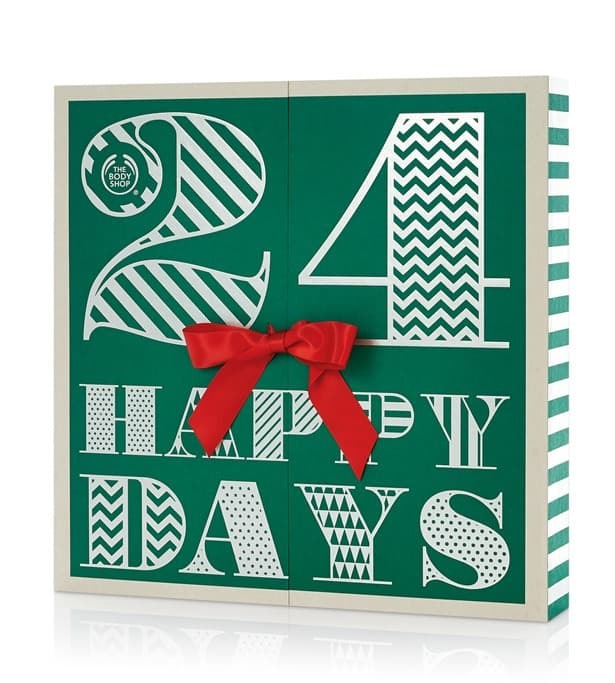 1 CANADIAN Mommy Moment reader will WIN a 24 Happy Days Advent Calendar from the Body Shop. To enter, leave a blog post comment telling us if you buy your kids an advent calendar, make one, or if you don’t do either. The #31DaysOfGifts is an event run in conjunction with our yearly Christmas Gift Guide. These posts are features of products and do not depict our regular writing style. Items received for Gift Guide features are donated to local charity. I always buy a chocolate calendar for each of the kids. We buy an advent calendar for the kids. We haven’t before but this year I got her a kids’ craft advent calendar – we’ll see what she thinks! When I was a child we use to do those chocolate Advent calendars. Each of my siblings was assigned a day to open to make it fair for everyone. We always have chocolate advent calendars! We buy our kids those cheap chocolate advent calendars – they love them! Yes, I buy my kids an advent calendar every year. We have a calendar for our girl this year! I actually bought advent calendars for my coworker . I am basic and just buy the chocolate ones in whatever theme is popular with my kids that year. We did Playmobil calendars a few years ago, though. This year, I wanted a Lego Star Wars or Playmobil one, but I couldn’t find one in stores – I waited too long. YES, I do buy them. We sometimes do calendars with the kids. This year, we are memorizing a little bit of Luke 2 each day of advent. have not gotten or made advent calendars yet – sounds like a good idea! Yes I get my son one and this years he wanted the lego star wars! I buy them for the grandchildren. Never purchased one. I did buy the chocolate ones for a dollar though. I buy advent calendars for my grandsons. I always buy the chocolate-a-day type of Advent calendar for my kids – they love it! No I don’t buy them. I buy a chocolate advent calendar each year for my children. We do not tend to buy advent calendars for our kids. They are nice but I would rather spend the money on other gifts. I always bought the chocolate calendars for my daughter and now she buys Lego calendars for her son, plus adds daily healthy treats. We don’t really do a calendar but we do bible readings. My child is to old for a calendar now, but when he was small I would buy him the one filled with chocolate. my son bought his little sister a Purdy’s Advent calender this year.. I usually just get the simple ones. We also have for them long felt advent calenders. I always bought one for my kids but I am made one for my grand daughter this year. I always buy an advent calendar for the kids! When they were little I did. I love the adult ones though. Very sweet. We buy our kids an Advent Calendar, the basic chocolate ones. Usually on December 1 because I always forget until that day! My sister used to make my older daughter one, sort of – she bought her a wooden house with 25 doors, and she would fill the spots with little trinkets for her, but for the past 2 years she hasn’t done it. 🙁 I think she is worried that our toddler will get into the box and could swallow the little items, so I think when she is older the house will get used again. I buy the cheap chocolate ones for each kid and then we also go through Anne Voskamp’s advent book which is AMAZING!! I have always made the kids an advent calendar, except for this year. This year we decided to try the Lego advent calendar. My sister-in-law is devoted to Advent calenders! I bought the chocolate Advent Calenders when my son was small. At that time, they didn’t have anything fancier, unless it was fancier chocolates. I don’t do advent calendars anymore, but one year I did it with books I got from a consignment store, I bought my daughter 25 books & wrapped them all, gave one to her each day throughout December. She loved it! We usually buy them every year! We have always bought them! My kids both have cheap and cheerful chocolate advent calendars. They were so excited to open the first windows today! always get the chocolate advent calendars. It’s kind of a tradition that I’ve carried on from my childhood – we buy the cheap ones at the drugstore! I made up ones a few years ago, and filled them with items they would love every year! No kid so no calendar and I really don’t care how many days til Christmas as I like giving gifts and don’t worry about getting them. For the past few years I’ve thought about getting an advent calendar but I haven’t been organized enough to get one…. We usually buy an advent calendar for our childen. My mom used to make be an advent calendar every year when I was a kid! The kids in the family get a chocolate one and I might treat myself to a David’s tea if I can find one! I have bought and made my own for the kids. We don’t generally do a physical Advent Calendar (with gifts), but do an animated one online. I always bought one for the kids, but a homemade one would be nice too and more personal!! I buy advent calendars every year for the kids. We buy one every year….tradition! We have a reusable one that doesn’t have any little chocolates or anything in it. It just has a Bible verse to look up each day. We buy, but next year I am going to try and be with it and make one! This year I bought advent calendars for my kids. Typically I make them but I thought I’d give myself a break this year. This is the first year that I did not buy any Advent calendars. Missed the Lego calendar this year. Bought a Spiderman chocolate one. Yes, I love the advent calendar and get them every year! I buy an advent calendar! We usually get a lindt one. I buy my kids an advent calendar every year. I buy my kids advent calendars. In Europe they have them and even when I was young I had one every year, I buy them for my niece and nephews every year now. We do buy little chocolate ones for the kids, and I reuse my Starbucks advent every year. Yes I buy my kids advent calendars every year. This year they got spoiled and have the Lindt ones! We don’t generally do advent calendars, but this one looks fun! We don’t do either, but I was thinking I might make one. They get advent calendars but my oldest eats hers in one day! I quit buying them for my daughter because she would always forget to eat the chocolate. If it was veggies she would get more excited. We buy the chocolate ones. Oh we actually have a whole collection (5! ), some get filled with chocolate, some are ornamental. My “kid” is grown, but I still get her a chocolate Advent calendar. When the kids were little we would buy the ones with chocolate in it. We have a handmade one we have had for years, it is only the numbers and you decorate a tree. But then we buy one with the chocolates for them. This year I am trying a book advent – a different wrapped book each night. It’s my first time. I always buy them, they’re a fun count down for the kids and gives them an idea of how many more sleeps. Always something to look forward to! One year when I’m not so busy I would love to make them! I buy my kids one every year. we buy advent calendars – this year we have a Lindt calendar and a calendar from The Face Shop – it is so exciting to open a door every day and see what gift will appear! Yes, we always do the kinder calendar. I’m thinking of picking up an advent calendar this year. I made my kids their advent calendar this year… so far day 1 was a hit..
My sister & I used to get chocolate advent calendars every year when we were kids & I’ve carried on the tradition with my 5 daughters. They look forward to their calendars each year but sadly, this is the first year I haven’t treated them to one as 5 can be expensive. They don’t like those cheap calendars that are $1 (the chocolate tastes like wax!) so it’s a tradition that we will hopefully start up again next year. I love the idea of adult advent calendars! We buy them. Last year we did a kinder surprise but this year we did a basic frozen calendar. We buy advent calendars…they are fun! We like to buy the advent colanders for the kids every year. It would be fun to make one, maybe next year. I usually buy them every year however this year it completely slipped my mind. Thankfully my husband remembered! I usually buy my daughter an Advent calendar but this December snuck up on me because my little one is ill.
We always buy a Chocolate Advent Calendar! I used to buy them when my children were younger but no any longer. If I could do an Advent Calendar like you are giving away I would do one! The kids have a chocolate one. I buy my kids a chocolate advent calendar, Id love a cool one like this for myself though!! We buy one every year. Part of the fun! We’ve bought advent calendars a few times but with candy behind each door, they never open just one. My aunt always buys me an advent calendar and now she buys my daughter one too. Tried it before, but stopped. My kids don’t like the chocolate ones. I need to find or make one with something else that the kids do like. I haven’t in the past. But this year i really noticed all the fun ones. I got my niece the starbucks one as she just turned 13 so she can have the chocolate and then treat herself to a treat with the gift card it came with. We used to get chocolate calendars but I don’t buy them anymore ! Yes I always buy my children the chocolate advent calendars. Its something they look forward to every year. My brother and I always had advent calendars growing up and I did the same for my son when he was little. He still enjoyed the calendar when he was in his teens. I prefer making advent calendars. I buy my son the chocolate Kinder advent calendar. I never made one but I did buy one once. Usually, they get gifts on the big day and that’s a lot of excitement. I don’t have little ones any more but did get chocolate ones when he was young. We haven’t bought them in a long time. an advent calendar- I don’t have any kids so I guess the Advent calendar would be for me. I like the Lindt Advent calendar but I’ve never bought one for myself. A few years ago, I had seen an Advent calendar with earrings for kids. I thought that one was nice since they could share. You know, I’ve never done an Advent Calendar! My children are grown and live far away so I don’t get to spend this time of the season with my grandchildren, so no Advent Calendars. I always buy the calendars for my kids – usually chocolate but sometimes Lego! We always had the chocolate advent calendars. I used to make & buy Avent Calendars when my children were younger. I have bought one lately for my grandson. No, we don’t do either one. We didn’t have any growing up either. I don’t have children but my mom always got me a chocolate advent calendar when I was a kid. I meant to give my daughter an advent calendar this year but December snuck up on me. Sometimes we buy them. I would like to make them some year. I don’t personally do either! I am pretty inconsistent. I love the idea of them but don’t like the variety…I really should try and make one next year. I buy them. I’m not that creative! We used to always get advent calendars but we haven’t done so in a while. This more sophisticated one would be the ticket! I usually buy several advent calenders! We buy the chocolate advent calendar. We always buy chocolate ones for the kids! I buy two advent calendars. I always buy a chocolate calendar for my granddaughter and 1 for myself. She eats her when she comes and visit! My kids like the Lindt and Kinder surprise Advent calendars. I often, but not always, buy an advent calendar fro my granddaughter. Used to buy when boys were little, don’t now. I haven’t gotten or made an advent calendar for my child yet. We buy our kids advent calendars with chocolate inside. We usually buy our kids the Kinder advent calendars. Don’t do either, at least we haven’t this year! Not really a tradition – last time we did it was more than a couple of years ago! I used to buy them but I’ve seen so many great posts on how to make them so I decided this year I was going to make one. We buy ours but I think it would be nice to make our own too. When my children were young I bought them advent calendars every year. I can’t wait to have grandbabies and start the tradition again. We have a fabric advent calendar that was a gift from a family friend and I buy chocolates/candy for each day. Every other year I remember to buy a chocolate one for the kids! Still need to buy a chocolate advent calendar for my girls! I’ve been looking for a reusable advent calendar, but I haven’t found one that I love yet. I used to buy advent calendars but haven’t in a few years! We buy them every year and we let the kids pick out their own. Normally I buy the chocolate ones for the kids but this year as a treat we splurged and got the Lego one! I buy my daughter an advent calendar! Advent calendars are a tradition – I usually buy but If I have time I love to get creative and make them too. I always buy an advent calendar! Yes I buy an advent calendar for the kids and even for myself! I like this advent calendar more than just a chocolate one. Usually, we get the Kinder ones. I <3 smelly things… the good kind though. I bought one for my daughter this year. Yes, we always bought the ones from the drug store. I always buy one for the kids. Every year I plan on making one but we always end up getting a plan chocolate filled one. I buy advent calendar but not the chocolate one usually something that they can assemble or do like Play-Do or Lego. I would love to try and make one next year!!! This year we just did chocolate! I would love to try and make one! but we usually buy them! I used to buy my kids an advent calendar when they were younger but not anymore. We buy the chocolate one and have a homemade one too. I always buy the kids and advent calendar. Never really thought about even making one! I buy a chocolate one for myself- but the Body Shop calendar looks like more fun!! I have not bought an advent in years! I bought my kids Advent Calendars every year they were growing up. Now they buy me Advent Calendars. I always bought my 3 kids an advent calendar, unfortunetly they are to old now! Up until my daughter was 20 she looked forward to getting an advent calendar! My mom sends each of my four kids one every year. The only Advent calendars I remember as a kid had little chocolates hidden behind each window and were bought at a German deli. They were a very special treat and it was hard not to try to peek into the next window before the date. Because they were so special and a big part of Christmas for us as kids, I still buy these and everyone, not just kids love them. I never seem on the ball enough to get an advent calendar. I buy my daughter an advent calendar each year. This year she wasn’t too interested in it though. We buy a chocolate advent calendar each year. Our parents usually each get the kids an advent calendar. We buy advent calendars, just inexpensive ones with movie characters on them. The Lindt and Lego advent calendars did catch my eye though. Maybe next year. We always buy the chocolate advent calendars for the kids every year.